There’s no motivation like real, red-blooded beta readers to make you dive back into a manuscript and rip it up. The beginning dragged, a couple readers said. I dispensed with the first chapter and wrote another. 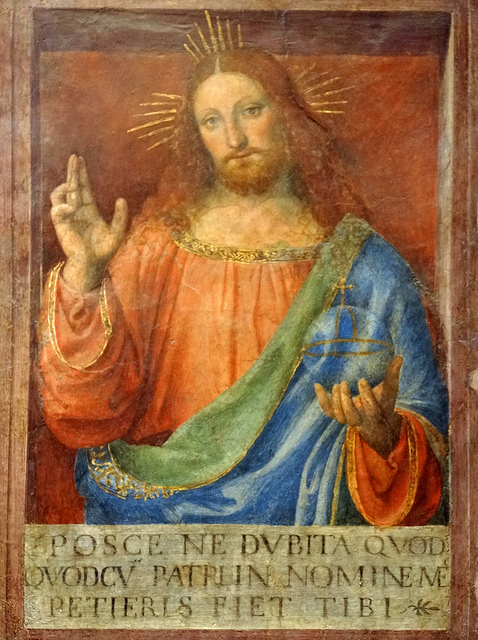 Blessing Christ, Savior of the World by Bernardino Luini. Photo by Dennis Jarvis. No one uses the word “frosh,” said a couple others. I hit Command-F and did a nice little replace with “freshman” and “first year” (depending on how eager Minerva Mae was to impress her feminist mentor). Personally, I prefer hate to apathy. Comments ranged from serious questions about character choices to concerns about whether Minerva should wear cords, jeans, or cargo pants. All of it mattered; all got attended to. Because there is nothing like getting a play-by-play set of reactions in the margins of your manuscript to make you care about your story in a whole new way. Thank you, Antonia, David, Erin, Gordon, Jamye, Katherine, Maureen, Sara, Stephen, and Tracy. Your diverse views gave me a robust portrait of how my character affects a range of people. Minerva has a whole new life now thanks to the hard work of these kind folk who could be reading or binge-watching or retweeting something else. (I know my competition, and it is fierce.) Minerva is ready for agents, and yes, another round of beta readers. Because an author’s work is never done. I know the novel can’t be all things to all people, but it darn well better try.